Recently, as you know I like to voluntarily spend time in classrooms working with students and teachers. Once a teacher always a teacher. It’s really important to me at Strobel Education to not lose the pulse of the classroom experience for our teachers and students. I think when a teacher leaves the classroom, goes on to become an administrator, coach, or consultant, you don’t realize what you’re walking away from. You will never again have that core group of students that you walk with daily. At the time, you just don’t realize what you’re giving up, which is the four walls of that classroom and what’s happening inside those walls. And as a consultant, I must keep myself in the trenches in order to be able to support our teachers. This particular classroom was a motivated group of fifth-grade students and their teacher who has infused the curriculum with two topics I’m super-jazzed about; Growth Mindset and Genius Hour. I’m a huge proponent of these two topics because I really do feel like we have lost our creativity in the classroom. Our education system has been so driven by the standardized testing movement and many schools, teachers, and students are suffering under the strain. Our students need opportunities to be creative, innovative, and explorative in order to develop their love of learning and to face the real challenges of the twenty-first century. And our teachers would like nothing better than to be able to infuse their curriculums with creativity again. 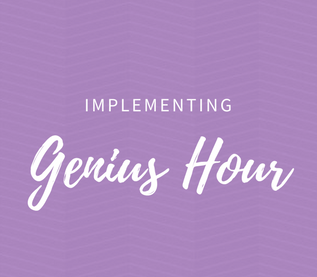 As a result, I’m so excited to be helping teachers implement a Genius Hour. Genius Hour is based on Google’s philosophy for their employees. Google’s employees are mandated to spend 20% of their work week researching, exploring, and investigating a topic, passion, or interest that is completely unrelated to their job description. Because of this, they found that 50% of their best ideas come from the 20% of the time they give to their employees to “play”. We have teachers everywhere who are implementing Genius Hour in the classroom, and they are seeing their students come alive. I recently spent time in both a high school classroom and an elementary classroom that have implemented Genius Hours. At the high school level, I saw a student who had made a website for her aunt who was opening a bakery, another created a genealogy book for his mother as a Christmas present, and another was starting a girls empowerment movement in her school. At the elementary level, I watched one boy learn how to code and create his own video games and a girl who was interested in making her own skin care products out of all natural household items. After researching natural skin care products, what ingredients to use, as well as their benefits, she made a face sugar scrub, a lotion, and a toner. These kids were nothing short of amazing. And I will tell you that every single one of these students was 100% immersed in their learning. And guess what? The teacher wasn’t teaching the students. The students were teaching themselves while the two of us walked around the room asking questions and supporting them in their learning. It was amazing to see the level of autonomy in the classroom, students motivated by having some choice in what they learn, and the way they truly took control of their learning. These kids are full of ideas and topics they want to learn about. When I asked some of them what their favorite thing about the Genius Hour was, over and over again they said things like, “We love that we get to be creative;” “It’s nice that we get to try things and if it doesn’t work out we get to try again;” “We’re not afraid to fail.” These students are infused with a Growth Mindset and over and over again, it was truly about the learning. Not only that, I saw the academic standards sprinkled all over the place during Genius Hour. They were utilizing speaking and listening standards, presentation standards, technology and education standards, math, writing, and researching standards. I have been blown away by what I see happening in classrooms who are integrating a Growth Mindset curriculum and a Genius Hour each week. I am so excited to begin delivering both of these topics this winter. Our students absolutely coming alive during this time, and as teachers, we love the results they are seeing. There are amazing things happening in our classrooms, and I am so proud of our students and our teachers, who are forging the way to cultivate twenty-first-century skills that’ll be needed in today’s world.